This post was updated on February 9, 2019. There are moments when a local history blogger is asked to address current proposals and their impact on the future of families and kids in one region. This is one of those moments, so I hope you will indulge me as I address a proposal which was discussed by the Cupertino City Council on February 5, 2019. All images are from the City site, unless stated otherwise. 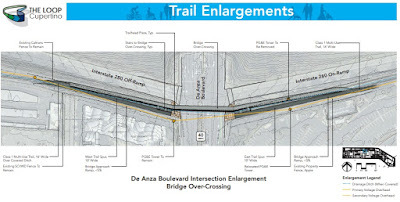 The "Junipero Serra Trail" is a proposed freeway embankment, bike and pedestrian pathway which would be created as part of the Cupertino Loop Trail, between the Don Burnett Bicycle-Pedestrian Bridge connecting Mary Avenue over 280, then over (or under) De Anza Boulevard along Highway 280, branching to Wolfe Road, Vallco and Main Street. Another segment would extend up and down Tantau Avenue, following Calabazas Creek to Rainbow Drive. (A segment of the Loop Trail would also extend along Regnart Creek.) The Loop Trail would then circle back near Stelling Road along the old railroad tracks, North to Mary Avenue. (Apologies, this is the best I could glean from the maps provided by the City online. "The Junipero Serra Trail is one of the trail segments that would make up “The Loop”. 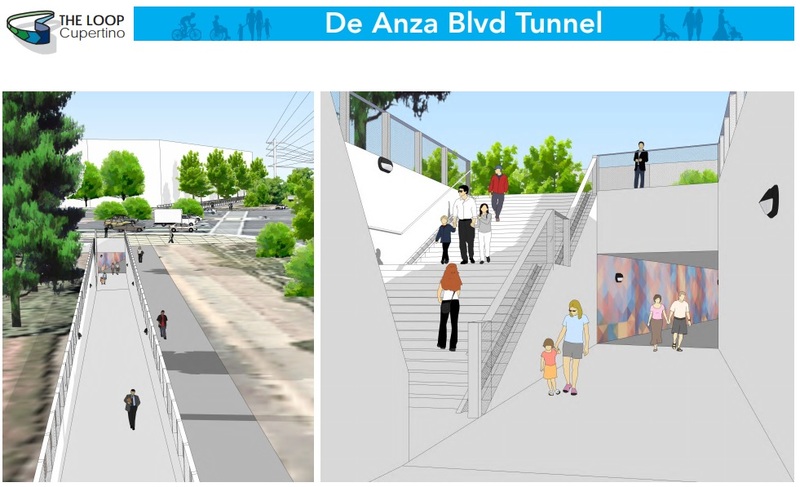 It will provide an off-street bicycle and pedestrian facility that runs parallel to the existing Junipero Serra Channel and Calabazas Creek and provide a connection between the Don Burnett Bicycle-Pedestrian Bridge and Vallco Parkway." Some residents are rightfully concerned with child, family, home and auto safety at the 280 section of the Loop Trail, particularly since the proposed, non-street pathways and tunnels (also proposed along Calabazas Creek and along the old rail line near Stelling Road) are not visible from streets nor easily paroled by the small Sheriff staff at the West Valley Substation. 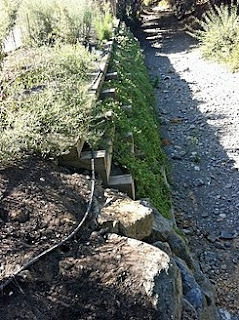 As you can see in the photos of Regnart and Calabazzas Creeks above, the perilous creek Loop Trail sites are hidden by trees and fences. Crimes can occur out of public view, leaving victims unobserved and unaided for hours. Kids can easily slide down the concrete retaining walls into the creeks, causing serious injuries while isolated, with no help available to them, if the Trail is otherwise deserted. The Junipero Serra Trail adjacent to HWY 280 is planned to extend under the South end of the Blaney Avenue Overpass (where Lucille ends at the older, street-level section of North Blaney), near dense housing developments with many young families and children in residence. Worse, at that location Lucille Avenue circles under the overpass to old North Blaney Avenue at a blind street corner (see the City Loop Trail Enlargements/Sections illustration below) where there are no sidewalks under the overpass. 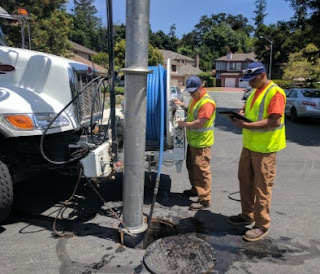 These conditions prevent motorists and pedestrians on the street from viewing and avoiding swiftly-moving oncoming traffic, which often includes moving vans, multi-axle vehicle haulers and trucks with flat bed or towed major construction equipment, along the Eastern base of the overpass, near Cupertino Lock-It-Up Storage. That Lucille/North Blaney Avenue blind corner, under the overpass is where the City has proposed a Junipero Serra Trail pedestrian and bike entry and exit access point along HWY 280, leaving many nearby residents concerned, due to the frequent speeders and drivers who ignore stop signs within feet of that blind corner, with oncoming traffic views in both directions blocked by the concrete base of the overpass. Further, the outer (North) curb under the overpass has an intentional opening to the culvert system along HWY 280. The locked gate at that site is designed to allow emergency and maintenance vehicles access to HWY 280 and the culvert system of underground highway drainage pipes which fan out under the roadway. 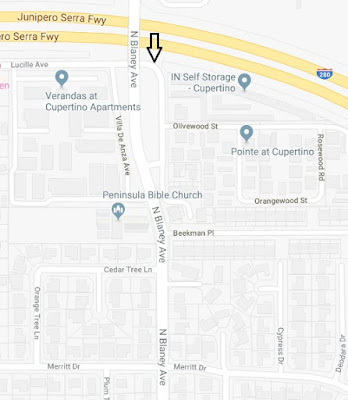 This location has no sound wall nor any protections for pedestrians and bikers, should a vehicle moving 65-70 miles per hour on HWY 280 leave the roadway and slam over the culvert onto a proposed Junipero Serra Trail path exiting near Cupertino Lock-It-Up Storage. The safety hazards of a Trail and pedestrian/bicycle access point at this location are serious and numerous. 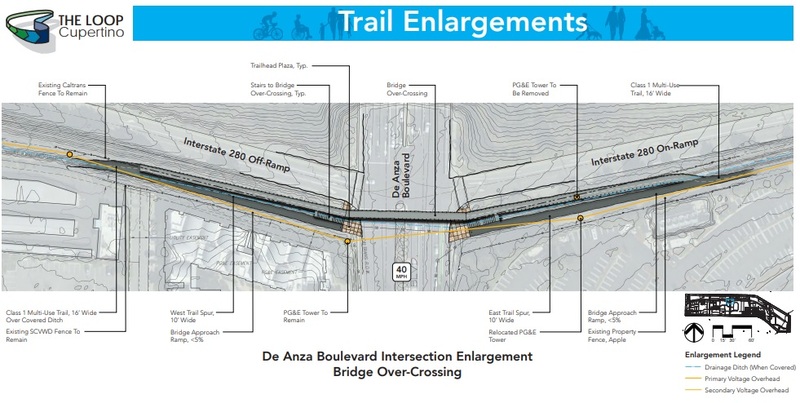 Instead, diverting walkers and bikers to existing bike lanes and sidewalks along Homestead Road, accomplishes the same goals of connecting walkers and bikers from the Don Burnett Bicycle-Pedestrian Bridge, past De Anza Boulevard to Wolfe Road, then onto Tantau Avenue, Main Street, Miller, Prospect Avenue and back up to Stelling Road and the Burnett Bridge, with far greater safety and with far greater road and patrol visibility should crimes be attempted. At Trail planning meetings, area residents stressed that the Lucille/North Blaney Avenue blind corner under the overpass had no space for new sidewalks and no protections from 280 mishaps, and was not an ideal place to encourage increased pedestrian activity, particularly for children, yet residents' comments and urgent concerns conveyed to City consultants were not adequately reflected in the consultant materials placed online for the 280 Junipero Serra section of the Loop Trail. Further east, the trail encounters a challenging 100’ long section starting below the Blaney Avenue over crossing to the open Junipero Serra Channel adjacent to Cupertino Lock It Up storage. At the bend of North Blaney Avenue, there is a 10’ wide pinch point between the sound wall and metal beam guard rail. A potential solution for widening the trail here is to shift the street curb line 2’ inward and relocate the guard rail accordingly. " Most residents in the area are very concerned as to how this entry/exit point near Cupertino Lock-It-Up Storage was ever chosen for a Junipero Serra Trail access point along HWY 280 and why it remains in the plans, despite multiple safety issues. Lucille Avenue has had multiple car break-ins impacting vehicles parked along the 280 side of the roadway. Plus, the connecting area of old North Blaney Avenue has experienced frequent, late night car-repossessions with multi-axle haulers blocking part of the narrow roadway at the base of the Olivewood side of the overpass, in the dark, just feet from the blind corner chosen for Trail access and pedestrian usage, shown in these photos. Moving vans and other cars entering and leaving Cupertino Lock-It-Up Storage and on Olivewood Road at The Pointe, often park near this blind corner, with some Pointe residents ignoring the stop sign at Olivewood, assuming that no cars ever approach from the blind corner or from Lucille, under the overpass. If the City wants to decrease severe pedestrian risks in the proposed Loop Trail plan, they will delete this Lucille/North Blaney Avenue blind corner as the site for a proposed Junipero Serra/Loop Trail access point. This issue and this site is one of the main reasons I wrote this column on behalf of some residents, since some neighbors expressed strong concerns repeatedly about this access point and access elsewhere along the length of Lucille Avenue to the City at Trail planning sessions, however their concerns seemed to have been minimized in the documents which Trail consultants placed online for the City. Most pedestrians avoid walking under the North Blaney Avenue overpass and stay on the sidewalk along Villa De Anza Avenue, near the Verandas Apartments, then cross over the 280 overpass, or walk south towards Merritt Avenue on North Blaney. (Consultants proposed a new sidewalk shifted two feet into the roadway from the existing curb at the East end of Lucille where it meets "old" North Blaney, along the metal barrier of the curb you see in the photos above. A three-foot sidewalk shift into the existing roadway would be even better, however, that would not remove the dangers from this blind corner where motorists approaching from either direction are not able to see kids or pedestrians on the other side of the tall concrete and dirt base of the overpass.) This is absolutely not a place to encourage foot or bicycle traffic, for obvious reasons which can be clearly viewed in the photos above. This, along with speeding along Lucille and the lack of any 280 accident barrier wall at the proposed Junipero Serra Trail access point has residents in the area concerned about child and family safety. The above section of the Loop Trail was referred to as the Junipero Serra Creek Trail in some City public hearing sessions. To correct that misstatement, the culvert along Highway 280 is actually a man-made drainage ditch to collect run-off from the roadway. The visible, surface-level culverts are connected to large cement pipes underground which are interconnected throughout HWY 280. 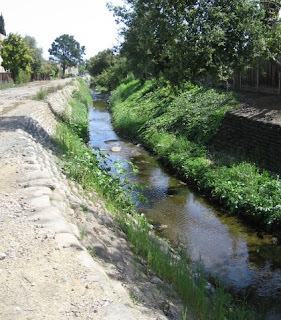 The area under or near HWY 280 in this section of Cupertino has never historically been the site of any creek. The site under the roadway previously consisted of orchards where City water was piped in for irrigation of trees and crops. In summer, particularly during drought months, the culvert and the curb sewer drains in this area emit a rotten odor, as effluent settles and dries with no water to wash it away. Occasionally, when residents complain, the Sanitary District will flush out the culverts and sewer pipes in this area to relieve the sewage smell. Residents who lived here years ago watched the North Blaney Avenue overpass being constructed in the 1970's. It consists of layers of dirt pushed upward by bulldozers into a wedge, reinforced by only one concrete wall on its North side, then topped by a concrete and asphalt roadway with some concrete supports underneath the tallest point of the dirt structure. This is not where residents want kids or families to linger, especially as this region is adjacent to the San Andreas Fault. There is a sound wall along 280 made of concrete bricks. 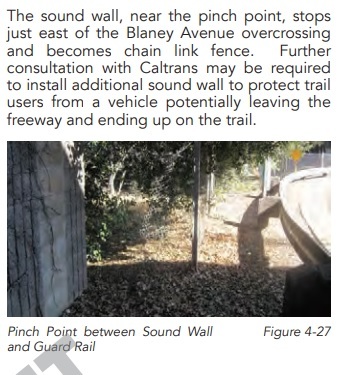 The proposed trail will open up some sections of the sound wall, vastly increasing loud and continual highway noise at all hours, for nearby residents. Residents living nearest to the overpass will be doubly-impacted, since freeway noise bounces off the concrete underside of the overpass roadway like an echo chamber, magnifying the decibels and distance which the loud and continual road noise travels into area neighborhoods, at all hours of the day and night, near family homes. Another aspect of the 280 Trail plan is to move some existing PG&E power line towers closer to residential homes, to create more room for the trail along the freeway culverts. 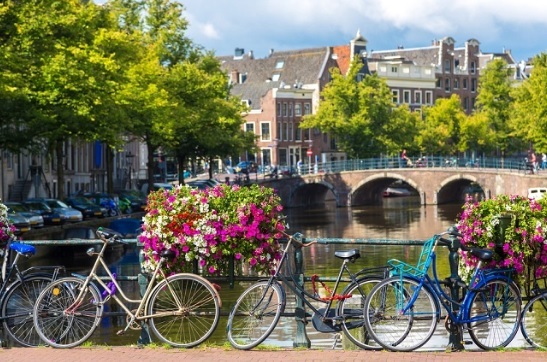 Exposure to these towers is controversial, from a health and safety perspective. More information on power line towers and health studies relating to cancers, can be found, at Forbes Magazine online, which has links to recent studies and reports. 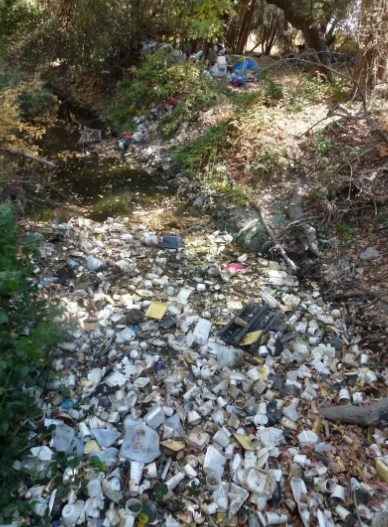 Trash viewed all along HWY 280 berms in our Valley, may become trash strewn along the proposed Junipero Serra 280 Loop Trail path, very near to homes and two busy schools in Cupertino, where children might walk, bike and play, unsupervised. Some residents regularly pick up plastic water and soda cans and bottles, cigarette butts, food wrappers, large boxes, bags of tossed trash, cigarette boxes, paper coffee cups, used diapers, beer cans, used personal products, etc., from accessible freeway ramps and the sides of overpasses and streets in this City near their homes, so local kids will not have access to that trash and it will not build up, encouraging more illegal dumping and trash in our neighborhoods. 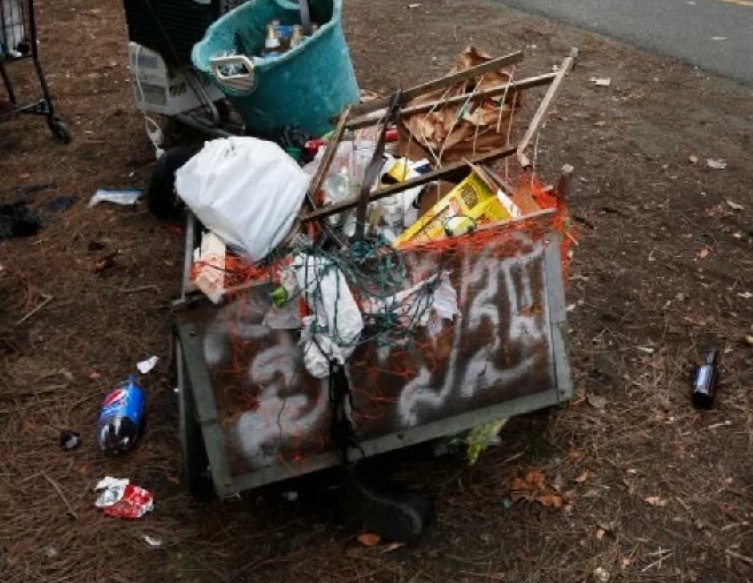 Likewise, Cal-trans has recently cleared-out trash and hidden encampments on berms between Lawrence Expressway and Saratoga Avenue exits along Highway 280, yet trash along 280 now seems omnipresent and continually visible on connecting berms along HWY 17/880, Hwy 85 and along most freeway landscaping in on-ramps and off-ramps of HWY 280, as you can see below. According to some Cupertino residents, the last thing the City of Cupertino and residents need are new breaks in HWY 280 sound walls with new, easily-accessible, adjacent freeway paths, all ripe for dumping and illegal camping, near two area schools (Collins and Lawson) and single-family or apartment homes on nearby residential streets. How have other Valley creek trails fared? "One reason people still shy away from the river is obvious. This neglected space through the city’s core is also where booming Silicon Valley pushes the societal injustices it wants to ignore. San José estimates more than 4,000 homeless people live in the city, and many of them make a life along the river. Walk or bike the trail, and you see tents under every overpass. Makeshift shelters grow thick in the willows lining the east bank of the river near downtown. It is clearly an environmental concern: Roger Castillo told me he sees homeless people poaching salmon and disturbing redds, leaving trash in the river, and digging into restored banks. Others told me people avoid the river because they fear the encampments." 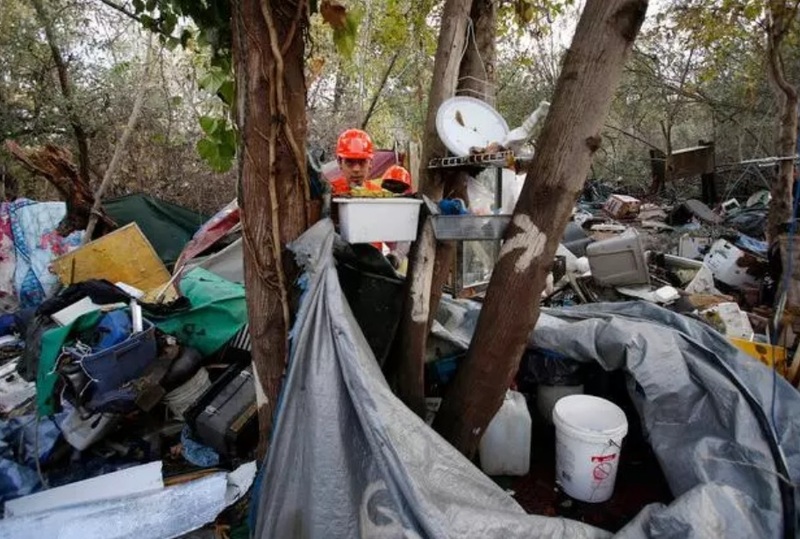 "The site was a place of misery where perhaps the nation’s largest homeless encampment, numbering as many as 300 people, once spread along a polluted Coyote Creek...Fencing and boulders were erected next to Story Road to discourage trespassers from coming back to the city-owned land. Rangers regularly patrol the area, breaking what had been an endless cycle of the vast encampment re-emerging after every cleanup. The Loop Trail, while a good concept for outdoor exercise and for enhanced bike and foot transit, would place more stress on neighborhood crossing guards near Lawson School and conceivably, near Collins School, due to increased auto traffic, foot traffic and bike usage, particularly near the back entrance to the Apple Infinite Loop campus near Lawson School at Merritt Drive. (The West end of Merritt Drive connects with Larry Way and Randy Lane behind Apple Infinite Loop, where more Junipero Serra Loop Trail access points are being planned for the West end of Lucille Avenue, along HWY 280). School crossing guards are not police officers nor traffic cops, yet they are already at risk, as are kids attending Lawson and Collins schools, due to intense traffic snarls and backups, as single family cars block driveways, clog streets and sometimes make illegal U-turns on Merritt, North Blaney and Vista Drive, to pick up children at both schools. Even the best monitoring does not seem to prevent parents and children from darting between moving, waiting or parked cars or to jay-walk across clogged streets beyond crossing guards and crosswalks, in an attempt to more quickly reach waiting cars, parents or children, before and after school hours. The situation has become so badly congested with complete gridlock existing on these three streets and their connecting roads between 7:30 a.m. to 8:30 a.m., then again between 2:45 p.m. and 3:30 p.m., that local residents are rightfully concerned that increased foot and bicycle traffic may further worsen conditions, which are already at critical gridlock mass, if the two proposed City Junipero Serra/Loop Trail access points along HWY 280 at Lucille and North Blaney avenues, and along HWY 280 on Lucille near Randy Lane and Larry Way, were to be built, according to Trail planners. 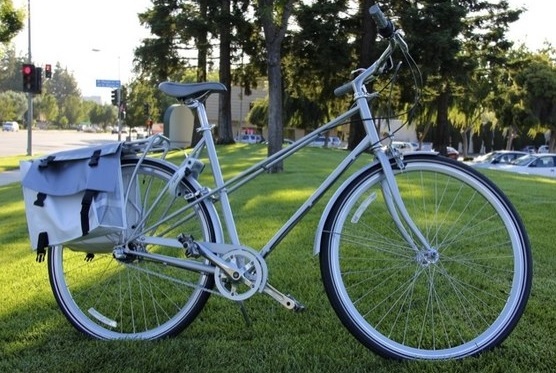 Many residents love Apple and recognize Apple walkers, bikes and bike riders. Residents report driving slowly behind Apple workers as they ride side-by-side in pairs while talking in the middle of local streets, or to avoid Apple bike riders gliding past stop signs in residential areas, or driving cautiously to avoid Apple workers who jaywalk on Lazaneo and Bandley Drive while heading to the Apple Cafe' and nearby restaurants. 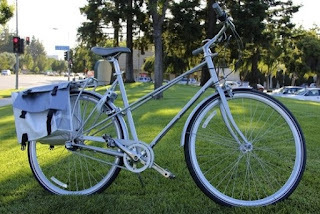 With gratitude for all that Apple has done for Cupertino, residents continue to pick up silver Apple bikes left on sidewalks and landscaping, placing the Apple bikes back on street corners, hoping someone from Apple will claim them. Now, residents notice lime green GPS bikes where Apple workers seem to travel along mid-campus routes, popping up near corners and in the middle of sidewalks. Again, these issues could be much worse, since residents also enjoy a more diverse and creative University-like vibe, with top-notch technical talent, an energetic, multicultural, entrepreneurial dynamic, all of which inspires edgy new businesses and eateries, in a City which has now become a global center for new technology and innovation. With that in mind, let's just say kindly and with no ill-will, that some residents believe that Apple already has provided a lot of free benefits for workers, including silver shuttle buses, catered meals and the aforesaid free bike usage. Creating a City-subsidized path along HWY 280 for the biking and walking ease of Apple workers to and from Cupertino Apple campuses, after the City has already invested in numerous wide, green-striped bike paths and sleek new speed bumps near Apple campuses, Apple staff commute routes and Apple staff after-work hangouts and eateries, makes it seem to some Cupertino residents that the City has done enough for Apple workers. Residents recall that the City devoted an entire, now-lost section of Pruneridge Avenue between Wolfe and Tantau, once a wonderful biking and walking path which changed names yet extended East across the Valley all the way to Piedmont Avenue and the entrance to Alum Rock Park, to accommodate the new Apple Park campus and its new entrance on Wolfe Road. Now, two new, poorly-timed intersection lights on Wolfe Avenue at what was once the beginning of Pruneridge Avenue (between Homestead and HWY 280) at the new Wolfe entrance to Apple Park, create multiple backups and increased co2 emissions from idling vehicles, as frustrated drivers wait, then wait, then wait some more, just to access ramps for HWY 280 or continue on Wolfe to Vallco, Main Street, Stevens Creek and Miller Avenue. 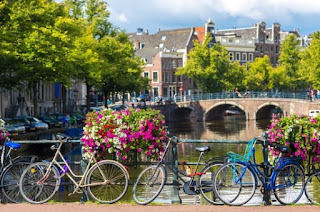 Sure, we would all love to live in a charming version of a new South Bay-style Amsterdam (a new windmill for Memorial Park and canals along Stevens Creek and De Anza Blvd.? Sounds great!) Yet, the City allowed our town to become far too overdeveloped for that green option. At the very least, the City should be creating more SB-35 affordable housing for workers employed at all wage levels in Cupertino at the old Vallco site and at other City locations, plus, parks for kids on the Northeast side of town. The City should avoid creating what is essentially a new version of a medieval boundary/ring road for bike riders and walkers, which a relatively low number of residents will actually use, due to the excessively noisy, drainage ditch-abutting location along HWY 280. The planned placement of new paths in hidden vistas, along HWY 280, inside walled and steep stream beds, and through tunnels---all areas devoid of even minimal safety sight-lines from streets and sidewalks, are a huge safety concern for area women and children. The proposed Trail path along HWY 280 (and the Loop Trail in general) seem somewhat ill-advised, according to some residents, particularly when just a few feet from Infinite Loop and HWY 280 on De Anza Blvd., Homestead Road leads directly to Wolfe Road and Apple Park, to Tantau and thus to Main Street and the Calabazas and Regnart Creek areas. Many of these streets were newly paved, with new or existing well-maintained sidewalks and bike lanes already prepared for bicycle riders and walkers, when Apple Park was being constructed. The HWY 280 Junipero Serra Trail proposal in particular seems like an expensive and unnecessary project, duplicating already existing bicycle and pedestrian sidewalk paths which were just created in recent years (and at great expense to tax payers), while so many other projects in Cupertino were and are still, left in limbo, and are more critically needed according to some residents. A new, multi-story parking garage for the library. A new City Hall and expanded Community/City Council Room, with adequate new and separate multi-story parking to accommodate residents attending public City planning meetings and City Council meetings, which may take place while the library is open. A new Teen Center with subsidized educational and social programs for youth, as well as teen robotics, engineering, art, music, recording and digital media production labs. These needed projects above seem to be areas where some residents would prefer new, value-added expenditures to occur in the City, since the above projects would serve residents of all ages and physical abilities, in a safe and accessible manner, unlike the proposed Loop Trail, which duplicates existing, newly-created bicycle lanes and designated pedestrian areas in Cupertino. Stanford has begun the process of removing the name of Junipero Serra from site names on campus. More localities are recognizing that his name should never be chosen for civic or private projects, due to ethical concerns. The only known portrait of Junipero Serra. 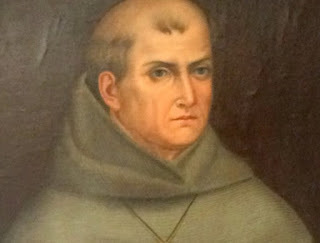 In September 2018, Stanford University decided to remove the name of Junipero Serra from campus buildings, citing that Serra and other Franciscan missionaries imposed religion on indigenous peoples, forced slave labor on native populations and decimated tribes with new diseases brought to native communities through his missionary work. To many, according to the CNN report, "Serra represents Europe's imperial conquest of native peoples." City staff could be sensitive in naming projects since some historic figures and symbols represent acts of genocide, subjugation of native populations, plus other regrettable moments in history, which should not be celebrated. The Junipero Serra name should have been avoided, since HWY 280 (as it is referred to now), yet once held Serra's name, has not been referred to as such over the last twenty years once Serra's actual legacy was revealed, in contrast with what many were taught for years in grade school. There have been many calls to remove Serra's statue from a San Mateo County HWY 280 Vista Point rest stop. City of Cupertino, please do not build the Junipero Serra (HWY 280 )Trail, nor the Loop Trail in Cupertino. The entire Loop Trail series of paths and access points, which are planned too near to local homes and schools, negatively impacting safety patrolling ability as well as nearby residents' privacy, safety and noise levels. Time and extensive/expensive City funds directed to Loop Trail studies, public meetings, artist renderings, flyers, booklets, Web sites and consultants, when the above "Cupertino's Critically Needed Improvements" bullet points are left unresolved, year after year in Cupertino, leading to parking gridlock at the library and at City Hall (where employees have to struggle to find parking a block away) plus a severe housing shortage for new workers and service workers, throughout the City. Please improve and better utilize the many newly-paved roads and new, wide, green-striped bike lanes in Cupertino, instead of creating yet another expensive project which duplicates recent City taxpayer outlays for already-completed pedestrian and bicycle improvements. There are already existing wide and recently painted green-striped bike lanes, plus newly paved streets and improved sidewalks, near HWY 280, the Apple campuses, the Don Burnett Bicycle-Pedestrian Bridge, Main Street, City Hall, Stelling Road, Homestead Avenue and streets near the Regnart and Calabazas creek beds. Instead, choose to better utilize Homestead Avenue and its bike lanes and existing landscaped sidewalks, to best protect Apple workers, local families, kids and nearby schools, on the first leg of a City-wide route between the Mary Avenue, Don Burnett Bicycle-Pedestrian Bridge, Apple Infinite Loop, Apple Park, Tantau and Main Street. From Main Street, instead of a new trail, please choose the new bike lanes and sidewalks on the newly painted and paved Wolfe Road, which becomes Miller Avenue when it crosses Stevens Creek. From Miller Avenue bike lanes and sidewalks, walkers and bike riders may continue on Miller to Prospect Avenue bike lanes and sidewalks, by turning right on Prospect, then proceeding past De Anza Blvd., where Prospect veers North and becomes Stelling Road, again, with more existing bike lanes and sidewalks. On Stelling, bike paths and sidewalks continue past Stevens Creek Blvd., where Stelling becomes Hollenbeck. Bike lanes and sidewalks continue on Hollenbeck leading past Whole foods, Quinlan Center, Memorial Park and finally, back to Homestead Avenue bike lanes and sidewalks, all with access back to the Don Burnett Bicycle-Pedestrian Bridge at Mary Avenue. All in all, this is a far more direct, visible and safe route, and a much more logical, inexpensive and family-safe route, to accomplish better City-wide bicycle and pedestrian journey from to and from the Don Burnett Bicycle-Pedestrian Bridge, through residential and commerce areas, on to Vallco, Main Street and the Apple campuses. Thank you for taking the time to read the concerns of some Cupertino residents on this site. Residents attended a Cupertino City Council Junipero Serra Trail Feasibility Study session on Tuesday, February 5, 2019 at 5:45 p.m., at the City of Cupertino Community Hall, 10350 Torre Avenue, Cupertino. Agenda and meeting documents may be found online. Parking is very limited during library open hours at City Hall, so not all residents may have been able to attend the Council session. 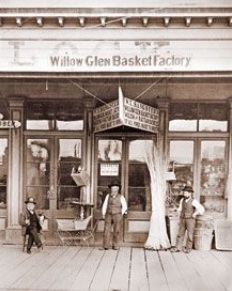 Clyde Arbuckle, a Willow Glen resident, was the first City Historian for the City of San Jose'. Born in 1903, Arbuckle experienced the 1906 San Francisco Earthquake with his half brothers and sisters, one of whom was silent film star Roscoe "Fatty" Arcbuckle. His family were pioneers in the Valley, having settled here in 1846. Arbuckle was raised enjoying family history stories about early Valley life. 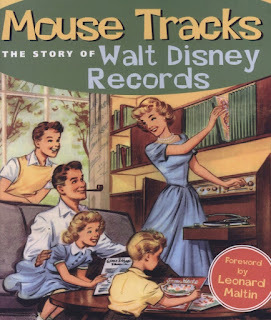 He became an ardent collector of records and lore about our local history. Arbuckle worked for the American Railway Express after leaving school at the age of 15. He was a professional Banjo player and along with his brother, an award-winning bike racer with the Garden City Wheelmen. He married his wife Helen in 1932. They had a son in 1935 and a daughter in 1936. Arbuckle built a new family home on Franquette Avenue (near Curtner), which had no electricity on July 4,1939, the day the family moved into their new Willow Glen home. As an avid and humorous public speaker and storyteller with a photographic memory, Arbuckle was popular with many local historic groups, where he was known for his iconic khaki shirts and pants, worn daily with what he called his "Denver" Stetson. In 1945 the Historic Landmarks Commission was formed and nominated Arbuckle to become the first City Historian for the City of San Jose'. In 1950 Arbuckle was named the first director and curator for History San Jose', a new organization dedicated to preserving the Valley's history and artifacts. Arbuckle and Theron Fox are credited with saving San Jose's history. 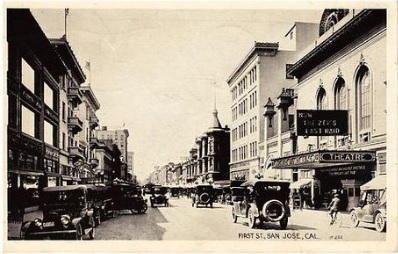 "In 1970, under the urging of friend and fellow preservationist Theron Fox, Clyde was commissioned to write the definitive history of San Jose. The history was published in 1985, printed by friend and history buff Leonard McKay (Smith & McKay Printing), who has been said to have contributed greatly to the book’s completion. 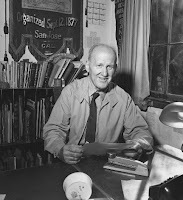 Clyde also wrote Historic Names of Persons and Places in Santa Clara County (with Roscoe D. Wyatt in 1948), and Santa Clara County Ranchos in 1968. He was an active member of the Ancient and Honorable Order of E. Clampus Vitas, the California Pioneers of Santa Clara Valley, and the Argonauts Historical Society, as well as being a Mason. In 1998, Clyde passed away at the age of 94. ---Submitted by Ralph Pearce on Saturday, March 15, 2014 - 5:01 PM." A number of Clyde Arbuckle's articles and books exist in educational institutions, archives and library collections. They are listed here in the Online Archive of California and OCLC's WorldCat database. Arbuckle amassed a large collection of photographs of Santa Clara Valley. The Clyde Arbuckle California History Research Collection is housed in the California Room at the Martin Luther King Jr. Branch of San Jose Public Library. Trad Jazz had a revival after the Swing and Beebop era of the 1940's, although it is said to span the 1930's through the 1950's in the U.S. and Europe. The New Orleans style of Trad Jazz had its resurgence with tuba providing a strong base note and a marching band style. 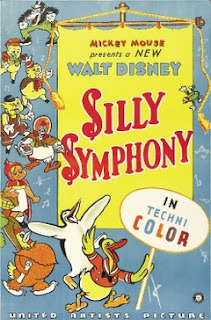 A trumpet played the melody while other instruments improvised together and in solos. The Chicago resurgence replaced the tuba with a string bass plus other stringed instruments like banjo and guitar, in a strong, fast-paced, two-beat rhythm with improvisational solos. Chicago-style musicians were Jimmy McPartland, Eddie Condon, Mugsy Spanier, Bud Freeman, PeeWee Russell and Bobby Hackett. 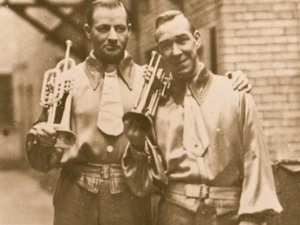 Cole Porter, George Gershwin, Jerome Kern and Irving Berlin also played elements of Trad Jazz in Chicago-style, sometimes called "Nicksieland" after Nick's Greenwich Village Nightclub where the music was popular. 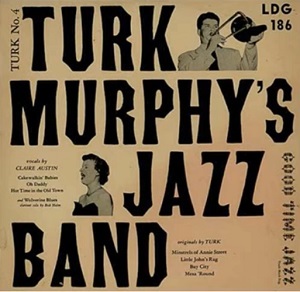 English Jazz pianist Margaret Marian Turner McPartland was a noted figure in the U.K., Chicago and New York Jazz scene, eventually hosting the popular Piano Jazz program on NPR where she played and interviewed notables from Jazz history and contemporary Jazz. (Jimmy McPartland was her husband, whom she met in 1946 while performing for the troops in Belgium.) You can hear some of her music on Youtube. 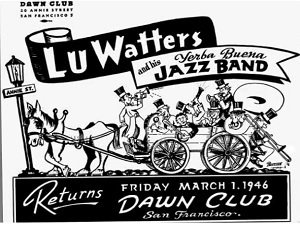 The West Coast revival began in the 1930's with Lu Watters and his Yerba Buena Jazz Band, who played at the Dawn Club in San Francisco. 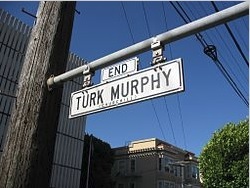 (Turk Murphy was an early member of the YBJB before starting his own band.) Lu opened a restaurant called Hambone Kelly's in 1947 on San Pablo Avenue, which was called "Music Row" due to the number of dance halls and music clubs on that street between Oakland and El Cerrito. Watters' band performed at his restaurant until they dispersed in 1950. West Coast bands typically used both banjo and tuba, plus brass horns and a washboard, with improvisation and solos blasting two-to-the-bar tempos. 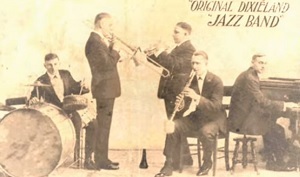 Around the same time, a Trad Jazz revival took place in the Low Countries (coastal areas) of The Netherlands, Belgium and Luxembourg, notably with the Dutch Swing College Band, who focused on Ragtime and New Orleans-Style Trad Jazz. These bands are larger than most Trad Jazz bands with as many as fifteen musicians, among the largest bands playing Trad Jazz today. The term "Dixieland" is not used by many contemporary Trad Jazz musicians due to its association with racist Jim Crow laws in the South. "Trad Jazz" is the preferred term. Enjoy some music from YouTube by clicking on names in this partial list of Trad Jazz greats.